OpenChannels is a project of Marine Affairs Research and Education (MARE) and supported by a grant from the Gordon and Betty Moore Foundation. As a vibrant online community of ocean planners and managers sharing experience, knowledge, and advice with peers, OpenChannels can speed the advancement of sustainable ocean management. 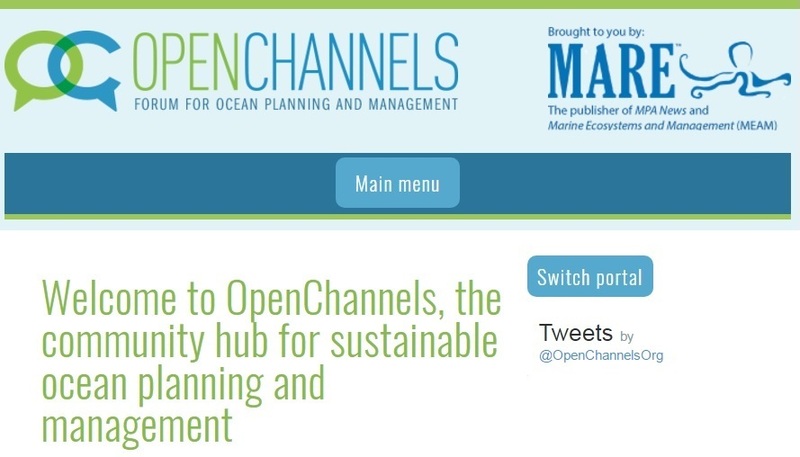 OpenChannels is the knowledge hub for the global community of practice on ocean planning, ecosystem-based management, and marine protected areas. OpenChannels is designed to be highly focused on user needs aiming to provide access to all the information that ocean planners and managers need to do their jobs most effectively, including existing high-quality content and new information products and services. With the latest news, literature (with currently 1632 freely-available items) , online events, grant opportunities, free tools resources, training, videos, blogs&news, and more, OpenChannels makes it easy for you to stay informed. A recent OpenChannels' blog-post "Designing a project with Open Science principles from the start" highlights elements of and assumptions for an inclusive planning process which guides a new research or restoration project with openness in-mind from the start, while ensuring you’ll have the funding and time to broadly share your results. and jargon that can mean many different things to different people and organizations. There are basically two main pillars of Open Science: (1) reducing barriers to access and (2) increasing transparency. For a quick starter to the many facets of Open Science, the Swiss National Science Foundation’s Horizons magazine covered this topic in their September 2016 issue. you give away your intellectual property (IP) rights and copyright for that publication. You cannot use your work for teaching purposes outside “your own classroom teaching and internal training at your institution”. can increase trust with both the data and derived results. Furthermore, public data allows anyone in the world to run additional analyses on your work. There are plenty of other benefits, too, least of all is that you will not have to keep responding to email requests for your data if it is publicly available online. Ask for the costs of publishing your results when seeking funding. P.S. In the past two years, OpenChannels has served over 50,000 professionals including ocean planners and managers sharing experience, knowledge, and advice with peers. “The larger the community, the more information is available and shared, and the more robust and self-sustaining the community becomes”.